We were motoring west on Long Island Sound, pushing to make an anchorage within two hours of Hell Gate Bridge’s notorious currents. For a tranquil passage through, we needed to be there at slack tide early the next morning, and to get within striking range we had to motorsail until after dark. The day had begun at first light on the Connecticut River, and we were trying to cover about 90 miles. 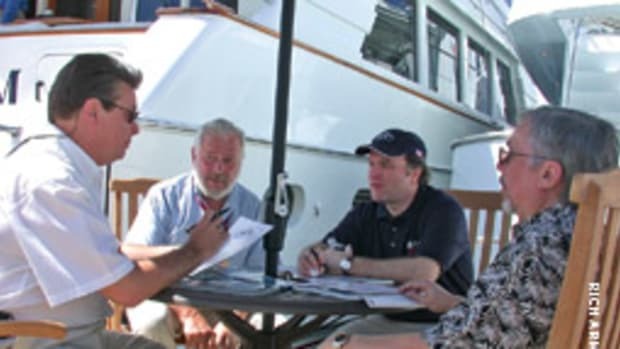 It was way too much to ask, either of Robin — my Westsail 32 — or of me and my crew — friends John Morrison and Curt Michael. And then the weather forecast came over the VHF radio: violent afternoon thunderstorms approaching from the west. I looked up to the western sky where high and hazy clouds were singed yellow in the summer heat, the sort of sky that confirms a weatherman’s nasty prediction. If I didn’t have to be someplace in four days, I thought, I’d pull into the nearest safe harbor and relax. Instead I pushed on, tense with anticipation. The thunderstorms did not materialize, and we made it through Hell Gate with no problem. But there would be more challenges, more reasons to wish that I had more time and wasn’t controlled by the demands of a deadline. First was the fog. We began to see it ahead as we slipped east around Governor’s Island to skirt the edge of New York Harbor. Within an hour, we were blinded by fog so dense that we only saw the Verrazano- Narrows Bridge when we heard traffic above us and looked straight up. With the three of us standing watch — Curt down in the cabin looking at the radar screen, John standing to port in the cockpit and straining to see beyond the bow, and me keeping track of the GPS (we had no chart plotter then) and looking to starboard — we managed to evade the thrumming of shipping traffic that passed by invisible. The fog had cleared when we reached the tip of Sandy Hook, N.J., but the wind began to blow from the southwest — on our nose. For a while it was a sunny, pleasant ride. Our plan was to motorsail all night to reach Cape May, N.J., by the following morning. That would keep us on schedule. The wind increased, however, and by noon we were riding a battering ram, pounding head-on into steep chop that at times brought Robin to a complete stop. At 1 o’clock in the afternoon we were five miles from Manasquan Inlet, a place with almost no anchorage. I knew we’d have to stop there for the night. It took us two more hours, with the bow rearing constantly like a bucking horse, to reach shore. We secured Robin to a fuel dock — for $120 a night — with a forecast of three more days just like this. I was swearing that never, under any conceivable circumstance, would I ever again put to sea with a timetable. And silently I began the calculation that I never thought I would entertain: how to sell Robin and get out of sailing. That was two years ago. Because Monica has a 9-to-5 job with limits to her vacation time — and I had been unemployed for a year — it made sense that I would deliver the boat from Chesapeake Bay to Maine, where she would come aboard. I recruited another friend, Tom Gilmore, to make the delivery north. John Morrison would accompany me on the return leg. It was business as usual, except with no schedule. Tom met me in Cape May, and we pointed Robin’s bow offshore. A grim sense of duty had taken over my brain. I went through the motions of sailing offshore, just as I’d done many times before, but there was no thrill. I really wasn’t pleased to be on the water. This was not a good thing, and I truly suspected that when this voyage was completed, I’d be looking for a way to end my relationship with Robin. The wind came up the next afternoon, and instead of motoring we were able to sail as we aimed for the opening between Long Island’s Montauk Point and, to the east, Block Island, R.I. Again, there was a forecast of violent weather along the coast, but we were offshore, so I wasn’t concerned. I’m more comfortable on a boat at sea than I am sailing in confined spaces. But I wasn’t excited. I saw the long line of storm cells etched in green on the radar screen and thought only of enduring them, getting on toward the next stop at Buzzards Bay, Mass. The storms came at night, just after we’d crossed the shipping lanes. 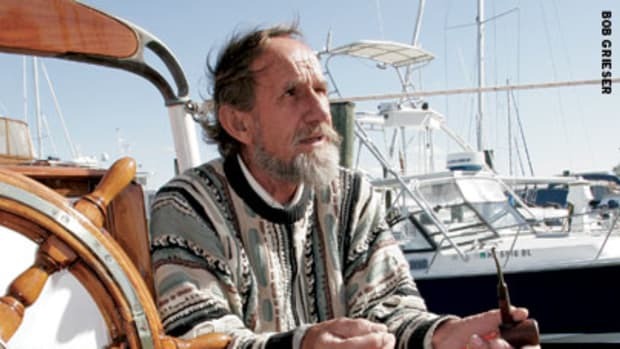 They were followed in the morning by a great northerly wind, and Robin sailed on a beam reach until, about 5 o’clock that afternoon, we anchored in Hadley Harbor. In the calm harbor at sunset, Tom and I dined on bluefish filets — we’d caught a 27-inch fish — and I’m pretty sure I smiled, perhaps for the first time aboard Robin in months. But one thing hadn’t changed: my mentality. In the morning, we left at first light to catch the current through the Cape Cod Canal. There was plenty of time to sail up the bay, spend a night in another anchorage and wait another day for the canal. But I wanted to make it to a party on an island in Maine the following day — Saturday — and so, ignoring my vow, I gave myself a schedule, a deadline. Despite thick fog, we made it to the party on time, guided by a new chart plotter. (Tom later told me he would have hove-to for safety’s sake.) 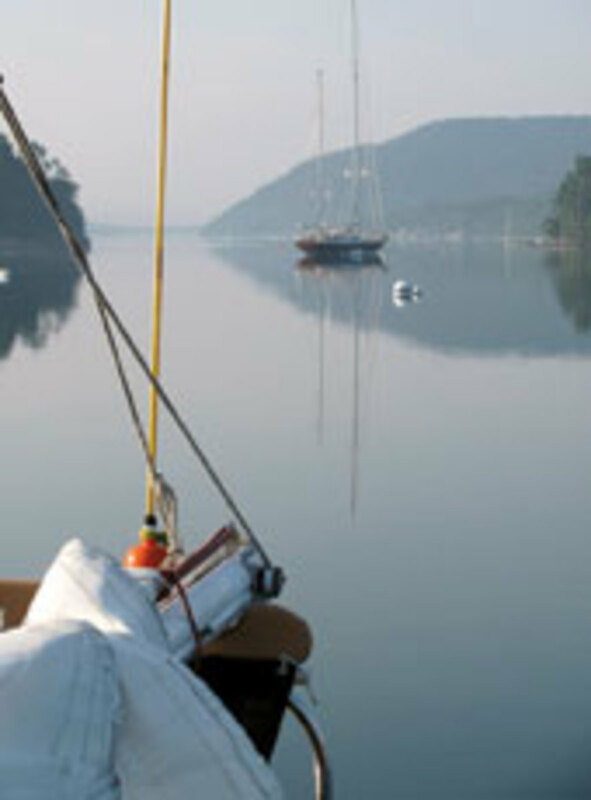 We anchored there for the night and sailed on the following morning for our destination of Rockland in Penobscot Bay. It was Sunday when we took a mooring, and Monica was not due to arrive until Friday night. Without any need, I had pushed to save five days. Now I was stuck in port with no place to go, only time to kill. So I wrote entries to my blog (www.dougcampbellsbooks.blogspot.com), caught mackerel for dinner, bought a student watercolor painting set and a sketch pad, and tried my hand at something sedentary. And I relaxed. 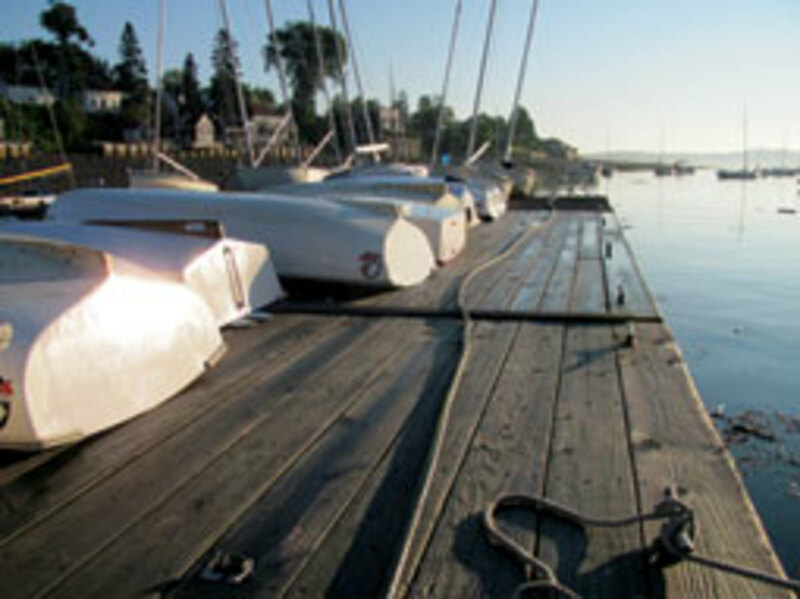 Robin finally left her rented mooring Saturday afternoon in Rockland with Monica on board. We sailed across the bay on one tack in a modest breeze, arriving at Pulpit Harbor, a well-protected anchorage where at low tide rusty rock ledges form the shoreline, above which evergreen forests hide a handful of homes. I fished — nothing bit — and Monica read in the cockpit until just before sunset, when we cooked dinner in the galley. The next morning, in scant breeze, we headed north, ghosting along between small islands under a perfectly blue sky with no specific destination in mind. It might have been noon — I didn’t record the time — when we arrived at Eggemoggin Reach, a thoroughfare between the mainland to the north and, to the south, the scores of islands that inhabit the east side of Penobscot Bay. I had sailed to Maine twice before but had not previously left the confines of the bay. The wind improved, and we sailed for the first time during this cruise into unfamiliar waters until we were just off the mouth of the Benjamin River on the mainland side. It seemed like a good place to stop, so we turned in to the river channel and, in a mile or so, dropped anchor. We were no more than perhaps 20 miles from where we had started the day. It had taken us most of the day, but we arrived in plenty of time to relax before we cooked dinner. When a sailboat pulled in behind Robin, I got out my sketch pad and tried my hand at painting her. Clearly, it wasn’t going to hang in any museum, but for once there was plenty of time for the meaningless. Monday morning was overcast, and at first there was little wind. On the eastern end of Eggemoggin Reach, we lost the faint breeze and started Robin’s engine to cut across to Blue Hill Bay. But we had time for patience, and soon we were sailing north past long, dark islands and beyond them, to the east, the large rounded shoulders of the mountains of Mount Desert Island. We had dinner and a tour of Blue Hill with friend Rusty Duym, and the next day we retraced our path in light winds that at times left us stalled. We really wanted to make Northeast Harbor this day in order to see our young friends, Lou Gallagher and Astra Haldeman. 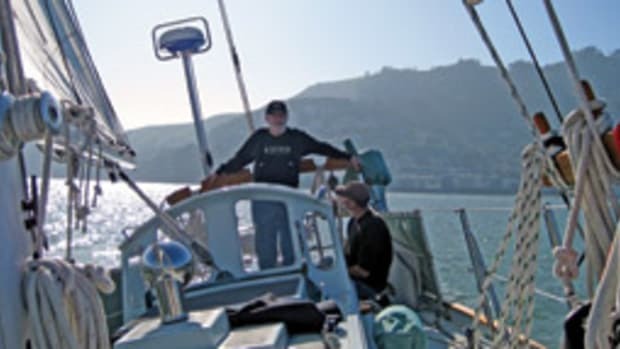 They had attended our local sailing school, and now they were living aboard and sailing charters on the Friendship sloop Helen Brooks, with Lou as the skipper and Astra the first mate. 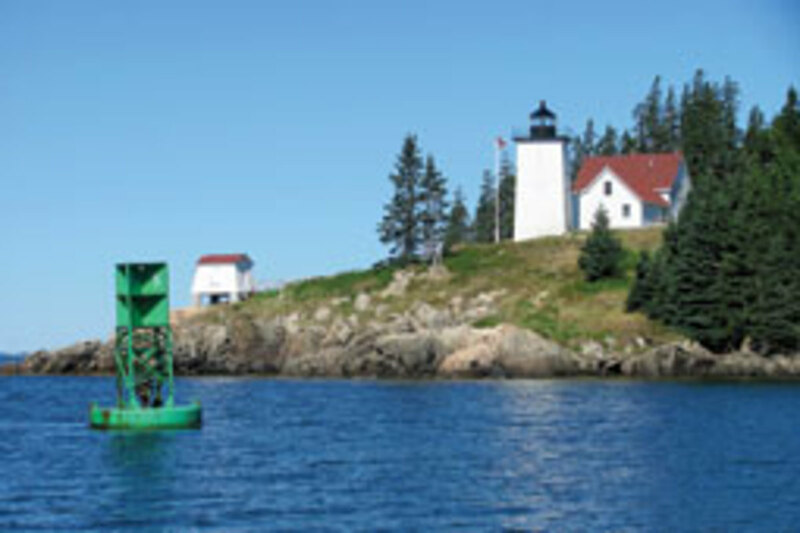 To get there, we had a choice: sail several miles away from shore or cut across a 13-foot-deep shoal off Bass Harbor. A cruising guide gave us directions, and we chose the shorter route, accompanied by a seal swimming beside us under a flawlessly blue sky, with enough wind to keep off the inshore ledges and the foaming waves breaking over them. At Western Way, the approach to Southwest and Northeast harbors, we turned to port and picked up a good beam breeze. As we passed Great Cranberry Island to starboard with a strong westerly breeze, I saw the distinctive sails of a Friendship sloop a mile ahead, apparently returning to port. Could it be Lou and Astra and the Helen Brooks? What a treat it would be if we could sail by! The sloop’s sails fluttered as it turned, and I thought perhaps he was dousing before entering the harbor. I was wrong. The sails filled, and the Helen Brooks took aim directly at us. In minutes, Lou and a party of five sailed by to starboard (Astra was at her other job in a museum), circled our stern and, as I spilled air, passed Robin to port. I was thrilled, and my cruise in Maine was now a certifiable success. What was making the difference was the scale of the place and the lack of a schedule. In Maine, and particularly Down East, there are almost limitless destinations, any number of them a short sail away from where you start. From Northeast Harbor, we could have continued east to Bar Harbor and then farther east to hundreds of more remote islands, bays, rivers and harbors. The weather was no obstacle in this, the best summer in 20 years, according to the locals. We had only two weeks, so we decided, for this summer, to end our eastward trek where we were. The next morning, in thick fog with 100-yard visibility, we motored up nearby Somes Sound, frequently if incorrectly called the only fjord on the East Coast. No sailing this day, but the sound was a must-see. 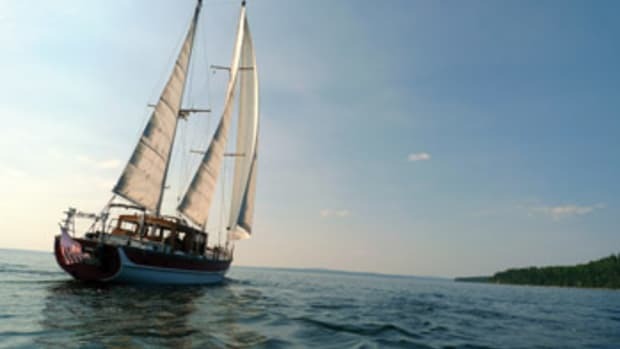 The next day, Thursday, a light breeze crept in from the ocean, and we sailed out past Great Cranberry Island, past the foaming ledges, onto the open ocean and southwest in the general direction of Penobscot Bay. In every direction were scenes worthy of postcards: sea swells crashing in white foam against fawn-colored ledges, boats with their snowy white sails filled, lighthouses in red and white, and the dark, saw-toothed horizon of evergreen forests that reach down toward the sea. 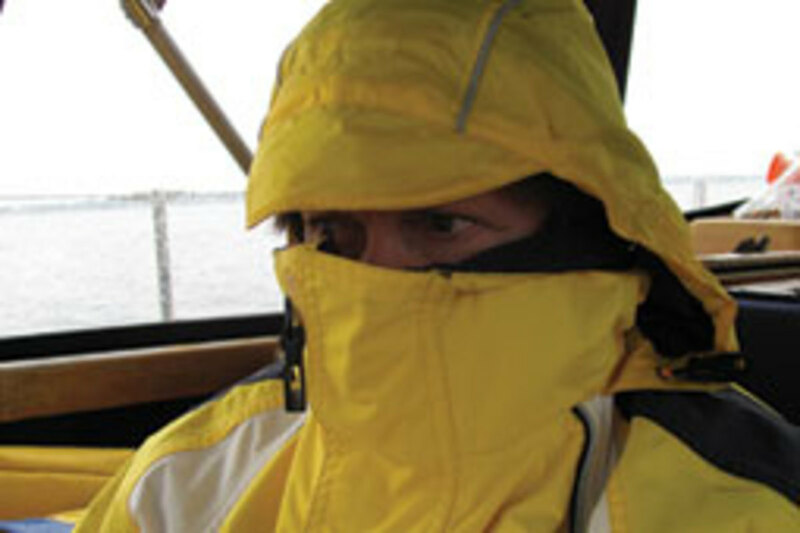 We sailed and motored to a well-protected harbor crammed with lobster boats on Swan’s Island. I sketched, cast the occasional fishing lure, and Monica read as the sun settled behind a spruce-topped hill, lighting the sky a raspberry red. 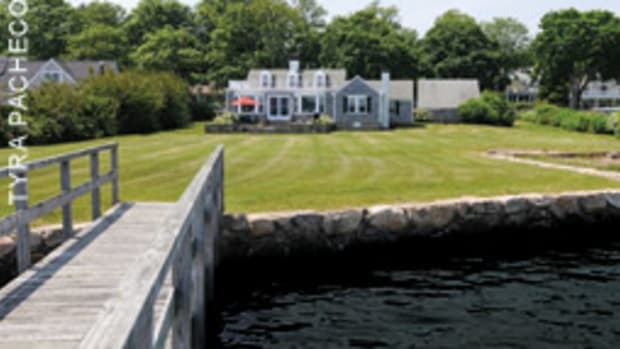 Friday morning, as we navigated past the white lighthouse with the red-roofed keeper’s house at the entrance to Burnt Coat Harbor, more sun and more wind urged us toward our next stop of Stonington. 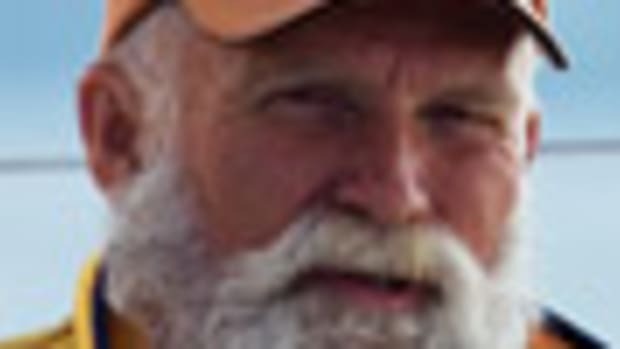 The wind was from the southwest, which was good because we needed to sail northwest to reach Deer Island Thoroughfare, a water highway running east to west between islands and ledges. The thoroughfare roughly parallels Eggemoggin Reach to the north, separated from it by Swan’s Island and the larger Deer Isle, home to Stonington. We hadn’t been ashore for two days, so once Robin was on a mooring at Billings Diesel and Marine we made a point to find the center of Stonington, a mile-and-a-half walk. As we walked back to Billings, the sun was setting over a lobster pound, its reflected glow filtered between the slender, branchless trunks of evergreens. A clear night sky promised a good morning. 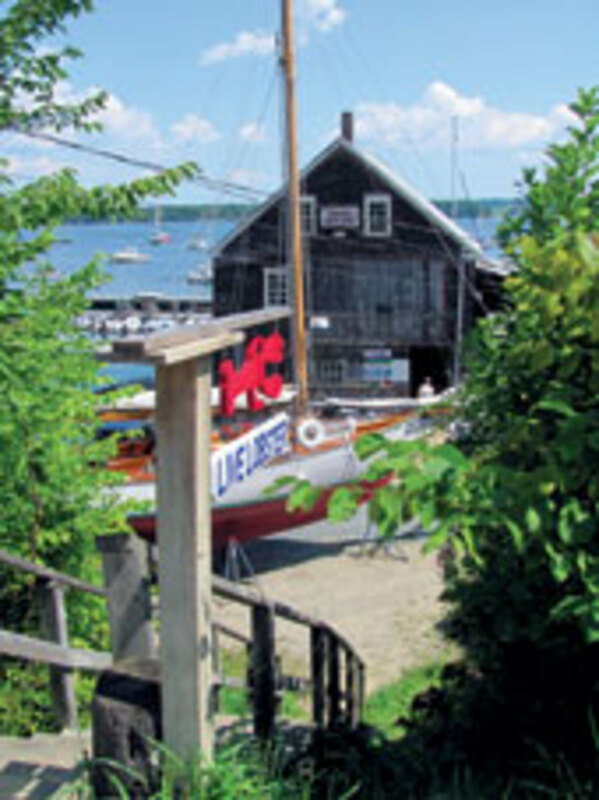 When it arrived, we headed west across East Penobscot Bay to the island of Vinalhaven. We had not selected a precise destination, but we knew there were two promising anchorages on the northern side of the island. The good news was that either Seal Bay or Winter Harbor was just across narrow East Penobscot Bay. Another short day aboard Robin. Another day of no rush, no stress. The wind came on strong after we’d passed the lighthouse on Mark Island. Robin heeled and plowed up a bow wave, and we were close to Vinalhaven well before noon. We weren’t ready to quit, so we came about, doused the genoa and sailed back across the bay at 7 knots with just the staysail and the main. The cruising guide indicated that Seal Bay would be better than Winter Harbor in a strong southwesterly. 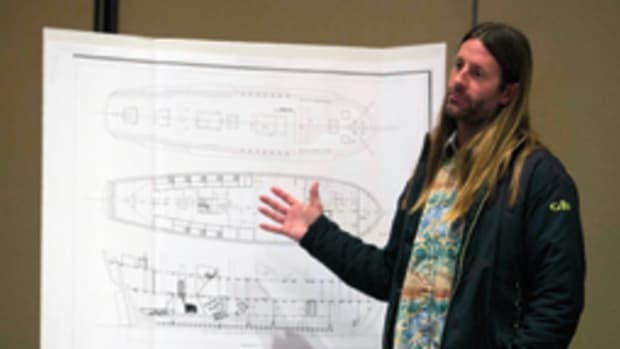 When we finally decided to head in (under a now overcast sky), we angled between some ledges and boulders and followed an S-shaped course deep into the bay, anchoring with a half-dozen other boats. I frittered away the afternoon, still trying to catch fish by casting into, across and down a strong breeze. Nothing bit, so we prepared dinner from our stores, as we had most nights. In the morning there was fog, moved by only a gentle breeze. But once again we were not planning a long day. 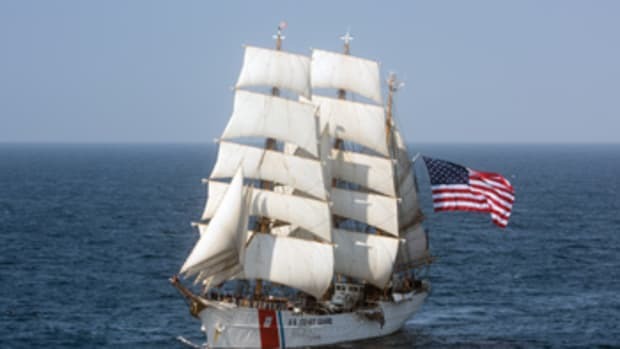 Back out on East Penobscot Bay, we raised the sails and aimed north toward Northwest Harbor on the western side of Deer Isle. Robin made only 3 or 4 knots, but that was fine. In the near silence we could hear the engines of any passing boats hidden in the fog. And although the fog was dense, it was not deep overhead, so there was a warm, yellow glow from the sun on its ascent. We were perhaps halfway to our destination when a shadow passed across our bow. 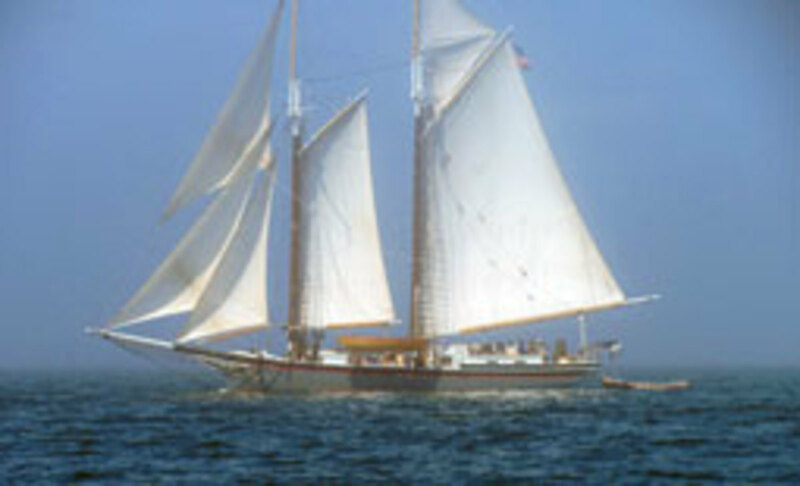 Then the schooner Lewis R. French emerged from the mist. She tacked and headed down our port side, disappearing as quietly as she’d arrived. By early afternoon we were out of the fog and off the mouth of Northwest Harbor. We circled some submerged ledges and sailed well into the 2-mile-deep bay before dropping anchor. And that ended our sailing for this cruise, for the wind made way for dead calm that lasted the next three days. In the morning we motored north to Castine, where we docked at the local yacht club for a modest fee and went into town for lunch. We were back in town and under an awning for dinner. An electrical storm provided the entertainment. The next morning we headed across Penobscot Bay for Belfast, motoring slowly, waiting for a breeze. None arrived, but that night we ate at a lobster restaurant before taking the dinghy in the dark back to Robin on her mooring. Our two weeks were almost over on Thursday morning. We had two days left before Monica had to be in New Hampshire for her return flight. We could have chosen a short trip once more. But with no wind to limit us, we turned on the engine and drove Robin back to Rockland, our starting point, a town filled with good restaurants and the sort of cute shops that lure Monica like old boatyards lure me. I dropped Monica at the airport on Saturday, two weeks after our cruise had begun, and picked up John Morrison, ready to leave Maine the following day. We had no deadline to get Robin back into her slip on the Chesapeake. We could loiter anywhere we chose. On two occasions we stopped to visit friends, content with having cut our sailing short. Yet in the end we made the whole return trip in nine short days. We backed into the slip in Cambridge, Md., at 7 o’clock on the ninth night. I stepped ashore, pleased to have spent the last five weeks with Robin and completely restored to the ranks of sailors.